The sky looks the same everywhere in California. I live in the Bay Area now, and it’s that same dimensionless, unreachable blue that I grew up seeing in Los Angeles. In Sunday school, the idea of heaven never made sense to me, because I couldn’t conceive of anything above the sky. The promise of California lies in the atmosphere above it: boundless, endless, immeasurable. It says that anything is possible here. The blue disappeared during the 1992 riots. I haven’t seen a black sky like it since. It wasn’t thick with smoke, it just was smoke, from the countless fires burning in the surrounding neighborhoods. My parents didn't allow me to go outside, because of the ash and fumes and the reek of charred industrial waste. The snarling fog of rage and destruction threatened to bear down and suffocate us — the part of the city that wasn’t protected by distance or decades of redlining. Like most neighborhoods, the one I grew up in goes by several names. We lived right outside Koreatown proper, within the South Central zoning lines. Nearby signs call it Pico-Union. It’s about 20 blocks north of USC, an institution wealthy enough to have earned the nickname “the University of Spoiled Children.” To a growing population of gentrifiers, it's known as Westlake. I saw a white hipster on a bike there last year and a panic fluttered inside me. My sixtysomething parents have lived in their apartment for the last quarter-century. With rent prices skyrocketing everywhere in L.A., I don’t know where they would go if pushed out. Much of what I learned in school, I unlearned at home. That’s probably true of many children, but the divergence is more pronounced when you’re from an immigrant family. A D.A.R.E. lady told us there was no point in taking up smoking, because we wouldn’t be allowed to buy cigarettes until we were 18. But I knew she was lying; I bought a pretty little teal box of Benson & Hedges for my grandmother from a street vendor when I was 5 or 6. In Korea, children are expected to do little favors for their parents and grandparents, like running down to the corner store. I explained to the middle-aged Latina woman who sold me the pack that it was for my grandmother, but she just gave me a knowing smile. She didn’t sell it to me on the sly, either. It happened in the open, in front of customers, on a row of Pico Boulevard street vendors who hawked food and clothes, electronics and household necessities. It was a bustling, buzzing community that I’d recognize when I visited Korea a few years later. Koreatown as a whole, and Pico Boulevard in particular, depends more on Latino help and influence than outsiders realize. One of Koreatown’s biggest intersections, Vermont and Pico, is just a few blocks away from where we lived, but my family's home was on a Salvadoran block in a Central American barrio. Most of the shop signs — for the bakery, the mini-grocery, the 99-cent store — were in Spanish. Little by little, the stores crowded out the street vendors; all that's left of them today are the ubiquitous bacon-wrapped-hot-dog stands along the Alvarado corridor by MacArthur Park station. I missed the friendly rumble of the stalls, but I understood enough about What Things Are Supposed To Look Like to know I was supposed to be happy about the triumph of the stores. And then, under radically different circumstances, they were gone, too. School segregation is a plague that robs children of the education they deserve and withers this country’s potential, but the ethnically segregated classrooms where I spent kindergarten to third grade — after which I bused out to whiter, more affluent neighborhoods — were a godsend. In a country where people who looked like me amounted to about 5 percent of the population, I enjoyed being part of a majority. I realize now how relieved my mom and dad must’ve been that they could conduct parent-teacher conferences in a language they were comfortable speaking. I was taught by bilingual Korean-American teachers who felt relaxed enough to go off curriculum once in a while to talk about how two-state Korea used to be three kingdoms. Aside from the fact that America fought a war there in the '50s, I never learned anything more about Korea in a classroom until I took Asian-American Studies courses in grad school. My second-grade teacher regularly reduced students to tears with her no-holds-barred scolding. In a dynamic that’s probably familiar to many Korean-American kids, I adored this strict maternal figure while living in absolute terror of her wrath. But we had a white substitute teacher the week the riots began. She taught us about the seven continents and how Antarctica and the Arctic Circle are nowhere near each other, despite kind of sounding the same. She did not explain what was going on several miles away, as my regular teacher might have. When we were finally told we didn't have to go to school anymore, I was relieved. I knew I wasn’t learning what I needed to know from the sub. When I think back, what infuriates me the most about my powerless, unhappy childhood was being told nothing and having nothing explained, except how to behave. (“But why?” “You’ll find out when you’re older.”) Immigrant Korean parents generally aren’t the elaborating type — maybe because they’re too exhausted, maybe because they want to protect their children’s innocence, maybe because they find explaining things at length to children an exotic concept. But there was no way that my parents could have contextualized the war zone just outside our door. The destruction of our neighborhood happened in waves. Some of the dingy-but-lively stores would go untouched at first; then, days later, when we felt safe enough to leave the apartment again for more than a few minutes, those same stores would be black holes, gutted by fire. Broken glass was sprinkled across every surface; I felt guilty for thinking it was pretty. The shops — and their owners’ and workers’ livelihoods — had simply been scooped out and discarded, leaving behind broken husks of varying degrees of stability. Nearly every storefront you could see from the intersection of Hoover and Pico was a ruin. It was a stark lack, an all-consuming loss. There’s a long and complicated story of how so many Korean-Americans came to own small businesses in black neighborhoods, but it boils down to one idea: relative privilege. Asian-Americans have their own history of oppression in this country, but in the postwar era, we generally haven’t been subject to the same assumptions of criminality or dealt with the same level of banking and housing discrimination that black Americans have faced. But it’s hard to learn that history as immigrants, especially if you’re working 12 hours a day, seven days a week, as many Korean-Americans have and do. Those were my mom’s hours when she had a failing video store. When she had a failing lunch counter, she never stopped working. And because of the stress that came with getting deeper into debt every month, she couldn’t sleep. One of my dad’s closest friends had a liquor store in Inglewood. I visited him two or three times a month as a kid, and was always surprised when a customer would come in who wasn’t African-American. I don’t remember my father’s friend as overtly racist, but he did have strategically placed mirrors over each aisle that he’d check on if he thought a customer was taking too long. Last year, when I finally learned about the 1991 killing of ninth-grader Latasha Harlins by a Korean-American shop owner, I was only surprised that the proprietress, convicted of voluntary manslaughter, received no prison time. When another black woman was attacked by a Korean-American beauty-shop owner in North Carolina last month, it was saddening and infuriating to see how little has changed. Surely no immigrant, in leaving behind everything they know to start a new life as a small-business owner in America, envisions someday battering or killing their customers. Spending most of their waking hours in their stores, they must also know that many of them are viewed with suspicion, if not downright hostility, by the people they’re financially dependent on. I literally couldn’t believe what I was seeing when I first encountered Long Duk Dong in Sixteen Candles while channel-surfing as a teen; it was so patently and purely racist that I was embarrassed for everyone involved. But even more painful is that one of the very few depictions of Asian-Americans I saw in movies growing up was in the emasculation, and sometimes the killing, of liquor-store cashiers. My father’s friend, who always offered my dad part-time work when times were lean, was shot about a decade later in his store. The last time I visited, the register stood behind a rampart of bulletproof glass. You can’t mistake that message: Any of you might shoot me again. He didn’t ever not work, it seemed, and he didn’t live to see retirement age; a few years ago he collapsed in his store, and he died in the hospital shortly thereafter. The aftermath of the riots was a good time to buy a liquor store. Once the violence was over, the classified sections of the Korean-American newspapers swelled with new listings. My dad talked big about buying one at "riot prices," but he was too scared to drive to the store to check it out. My dad had always wanted to immigrate to America. Coming of age in the '60s and '70s, especially in poverty-stricken postwar Seoul, there was no better sign that you’d made it. Now, it was a time to wonder — probably not seriously, but you’d have to be a fool not to consider it — if we had to go back. It was clear nobody wanted us. The United States is home to the largest population of Koreans after Korea and China, and the Korean-American community in Los Angeles is the nation's largest. Manhattan’s “Koreatown” is two streets; L.A.’s is its de facto city center. Black Americans suffered the bulk of the casualties during the riots, and it was state violence against black lives that sparked them in the first place. But Koreatown suffered the most property damage during those six furious, fearful days. Korean-American businesses were destroyed at a disproportionate rate; the LAPD largely abandoned Koreatown in order to safeguard the storefronts of white and wealthy Beverly Hills, six miles west. “The police let it happen” was a common refrain among Korean-American store owners not just in 1992 Los Angeles, but also in 2014 Ferguson and 2015 Baltimore. Destroyed businesses aren’t ended lives. But businesses do represent dreams and hopes and livelihoods and life savings — and the sudden demolition of those things deserves to be remembered. I was lucky to have an Asian-American history teacher in high school — one of the rare times I had an Asian academic role model after leaving my neighborhood schools. We spent an entire week on the internment of Japanese-Americans during World War II, and Mr. Toy was careful to impress upon us the monumental injustice of the 1882 Chinese Exclusion Act. But we breezed past the riots. And so the only thing that I retain from that chapter is a terrifying photo of a Korean-American man in a polo shirt posing with an assault weapon on a rooftop, smiling. Perhaps he was hiding his fear under bravado; perhaps he looked forward to what he could do with his gun. I recognized the red-and-white sign behind him immediately: It was for the Korean supermarket on Western and Fifth, across the street from my uncle’s dental clinic. 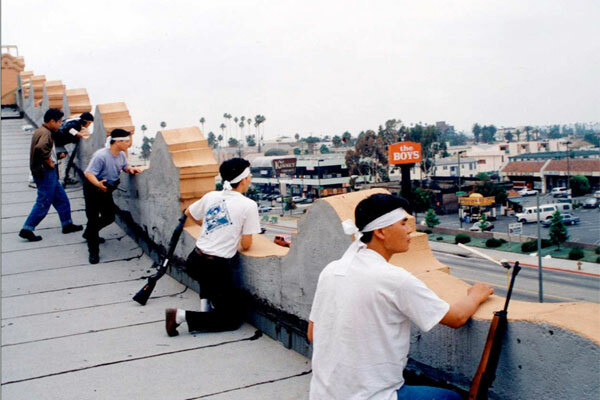 While my family hid out, surrounded by cinders, many of Koreatown's men took up arms. These weren't the hapless, dickless men we'd all seen in the movies. Because of the ever-present threat from North Korea, South Korea practices universal male conscription. It’s a despised obligation, but also a source of great pride; the few who weasel out of military service, usually the ultrarich, are rightly looked down upon. Therefore, there is a better-than-average chance that your ordinary adult male Korean immigrant knows his way around a gun. In the past 25 years, Korea became a relatively rich nation. The glossy, futuristic image it presents to the world — via government funds dedicated to promoting that image abroad — conceals cruel income inequality and an economy built on brutally long hours, even for white-collar workers (despite legislation ostensibly restricting employees to a 40-hour workweek). You can see some of that hyper-precise East Asian luster in the main intersections of Koreatown today. Mall-like supermarkets with floors so shiny you can see your reflection in them have popped up every few blocks. A gorgeously far-out mural hand-painted by artist April Greiman looms over the Wilshire and Vermont subway station. Between the deco apartment buildings, the lacquered retail destinations of right now, and the odd monument to traditional Korean culture, Koreatown is finally, in the ad-hoc, unplanned way of many L.A. neighborhoods, becoming architecturally interesting. But despite the $600,000 two-bedroom condos popping up like (literally) pale imitations of kimchi on white-hipster-restaurant menus, living in K-Town — note the moniker's slangy erasure of the country from which the neighborhood takes its name — is still spoken of like an initiation rite by outsiders. Every time I visit my parents, I see young white college grads chatting with theirs while unloading a U-Haul. The first goal of those transplants is to get out of Koreatown; even Conan O’Brien segments on K-spa tourism won't cure them of their yearning to move to a “nicer” neighborhood. Koreans are “safe” enough to coexist next to, but these arrivistes don’t want to live among us. This idea is crystallized in an episode of FX's You’re the Worst, when failed comedian Dorothy decides to give up her performing career and move back home to Florida. Despite her adoring boyfriend’s protests, she knows she’s a loser, because she’s only ever lived in Koreatown. The fantasy of a postracial utopia clangs loud and often against the realities of gentrification and displacement. That a community had to form impromptu militias to defend its right to live and work here means nothing to these newcomers. That the residents rebuilt the neighborhood from literal ashes is something most of them will probably never know. That the 25th anniversary of the riots brings the country's attention back to police violence against black and brown people is necessary. 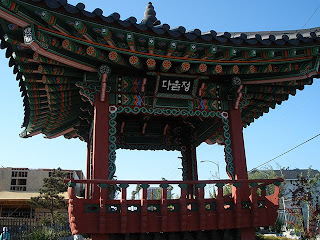 But what gets lost once again, as the neighborhood uneasily accommodates new strangers, is the history of Koreatown, of its destruction and its resistance.